Almost a year on from the last issue of Barbados Stamps, Renewable Energy, we have the first new issue of 2018. 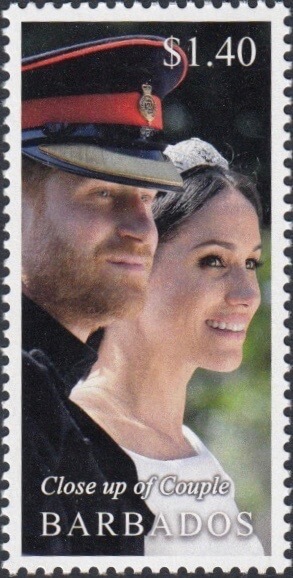 The new issue celebrates the wedding of the Duke and Duchess of Sussex, Harry and Meghan, which took place at St George’s Chapel, Windsor on 19th May 2018. The issue consists of a set of four stamps with values of 10c, 65c, $1.40 and $2.20 along with a Souvenir Sheet (or minisheet) containing three $3 stamps. Unusually, the three stamps of the Souvenir sheet mirror the designs of the 65c, $1.40 and $2.20 stamps, and int two cases they are identical other than the value tablet. 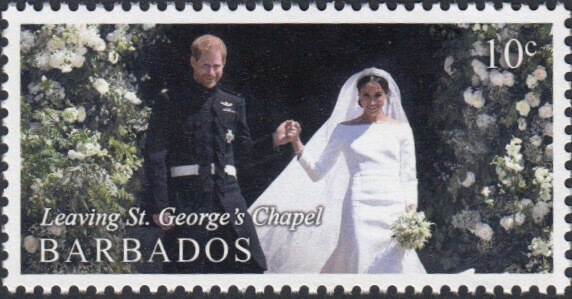 This begs the question of whether, when they are listed in the next Stanley Gibbons catalogue, the $3 stamps will be given their own catalogue numbers or whether the minisheet will be a single catalogue number? 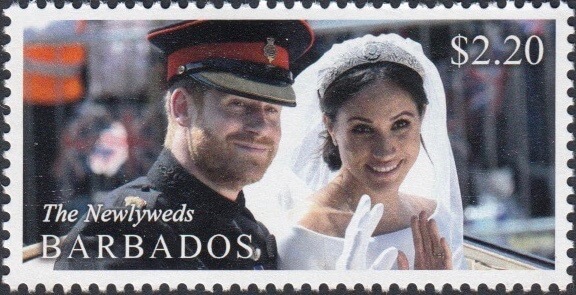 Prince Harry and Meghan – now Duke and Duchess of Sussex leave St George’s Chapel, Windsor to be greeted by well-wishers after the ceremony broadcast to the world that captured the hearts of millions. The couple exchange vows at the heart of the marriage ceremony conducted by the Archbishop of Canterbury Justin Welby at the altar of St George’s Chapel, Windsor. Prince Harry and his wife Meghan, Duchess of Sussex, prepare for their carriage procession through the cheering crowds lining the streets of Windsor. The newly married Duke and Duchess of Sussex in the Ascot Landau carriage embarking on their procession through the streets of Windsor following their wedding at St George’s Chapel, Windsor. 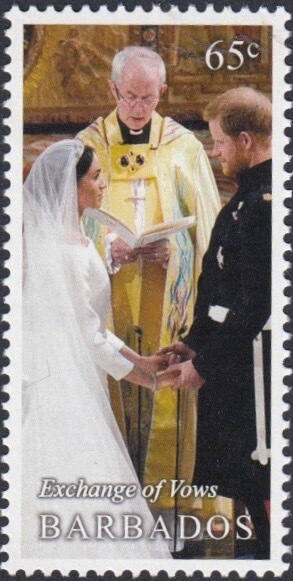 On the whole the issue is quite attractive with the stand out image being the close up of the couple as shown on the $1.40 stamp. The stamps are printed in four colour Litho by Lowe Martin Group and are perforated 13.3. The official release date is 19th November 2018. What do you think of the stamps? Feel free to let us know in the comments box below. Nice! Just a bit disappointed there is no $1.80 stamp (rate for Canada and US). Seems a strange omission but I do like the set, especially the $1.40 which has real ‘stand out’. Edit: Spoke to the Bureau and the $1.40 is the second step internal rate and gets a lot of use, hence the stamp. The BPO website has been offline for some considerable time whilst it undergoes a rebuild. I’ve sent you a separate email with details of how you can acquire this FDC.